For a chance to win Ellen 12 Days Of Giveaways 2017 tickets, visit www.ellentube.com/category.html#category=giveaway and sign up with your email or log in with Facebook/Google. If you have an account, you have already been entered to win. Who Can Enter? 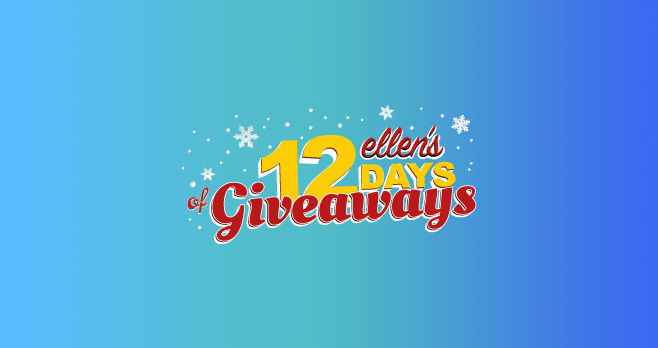 Ellen’s 12 Days Of Giveaways 2017 is open to legal residents of the United States, the District of Columbia and Canada (excluding Quebec) who are at least 18 years of age on the date of entry. When To Enter? The Sweepstakes Period begins at 12:00:00 a.m. ET on November 6, 2017 and ends at 11:59:59 p.m. ET on November 19, 2017. How Sweepstakes Winners Are Chosen? Sponsor will conduct a random drawing of one potential winner on or about January 8, 2018. What Are The Sweepstakes Prizes? The Grand Prize consists of a trip for two to one of Ellen’s Days of Giveaways. Abundance Shared! Amazing! So much fun!! Would love to go to her show. I would love to come to the Ellen show and thank Ellen if i can because has helped me through my most troubling of times.I loss my wife of 7 years to congestional heart failor. What made it the worst for me was she was in bed next to me when she passed away. I thought she was sleeping so i made coffee and when she didnt respond to me i called 911. The 911 operator told me to lay her on the ground and try CPR but she was gone but i tryed to bring her back. it’s been almost 4 months now and Ellen has helped me be see the light again. She lifts me up and gives me courage to fight on and keep living life and don’t give up no matter what. Ellen sends a message of hope and inspiration.So i guess this Christmas will be different so thank you for giving me the time to explain why i would to come to Ellen Christmas giveway. I know Debra my wife will be there in spirit with me. It will be my honor to be at 12 days of Christmas.. Dont wanna make any excuses just need a Big break..?? My husband and I divorced one year ago and I am still very depressed.I always wanted to come to Ellen’s show.The only thing that keeps me going is the foster children I have in my life. .Ellen you are my and my kids role model and hero. You give hope to everyone. You are so caring towards people and animals. You are so inspirational. I do have another daughter Vicky who works in ER and also very loving towards animal and has 1 pit bull. She is also very caring person and hardworking. I would love for her to come to your show, but I know you give only 2 tickets. We love you. God bless you and Portia. I would be the most happiest person on this earth to see my daughter and her boyfriend at your show. My Family means everything to me. I would give my life for them. I would love to do the 12th of Christmas I really fell in love with Ellen even more last year when I was home recovering last year from hip sugary it was really my high light of my day I would laugh cry and really praise her for her big heart now it has become my daily talks show tapping since losing my mother 5 you ago I have been the person who has become the giver of my entire family it would really be nice to be a part of one of these shows it has always been my dream to visit LA. Whether I get to come or not I would like to thank Ellen and her show for being nice and kind to so many God Bless you. Would love to win- being a UPK teacher for over 30 years and looking forward to open my own Day Care in NJ its tuff! and my intention is to help single mothers to work so I will charge minimum fee as a help. I am on the waiting lit in NJ and hope and pray my dreams come true. I LOVE watching Ellen, she makes me laugh in hard times…. I lost my husband in April due to ALS, a dreadful life robbing disease with no cure. My daughter lost her mother in law in May and then on a business trip to the Dominican Republcans she had an accident that caused her to be in hospital on her return. She was in hospital for 2 weeks, had numerous blood clots and a severe infection. This year has been VERY difficult for the family and being lucky enough to be invited to Ellen’s 12 Days of Christmas would be a huge “pick up ” for us both , as it will be a hard Christmas this year. I would love if my oldest daughter was able to win this. She is one of the hardest working single parents out there. She has raised her daughter by herself since she was 1 years old. She works and is finishing college this year to become a teacher. She is also is the helper for her daughter’s teachers class. I can’t tell you enough how much she deserves something like this. She doesn’t date because she says she doesn’t have time because she needs to focus on what’s best for the two of them. I love all the good she does for people makes me cry all ways. I am a 72yr. old grandmother. Love to win 12 day of Christmas. This is the most WONDERFUL time of the year and why not spend it with the most WONDERFUL person of the year ELLEN !!! Excited to enter, I hope i’m lucky enough to win. Love to enter, being watching for a few years so I thought it might be time to try. So here goes. Good Luck all. I would love to meet Ellen and be on her show to thank her for all the love and laughter that she has brought to me in a time I needed it most. I would love to bring my son with me as well.as we have had a lot of sad hardships thrown at us and I would love to just sit and laugh with Ellen. And to see my son laugh again would truly be a Christmas blessing. I have been wanting to go see 12 days for as long as she’s been doing them. I think she is one of the most generous people I know. Not so much for tge 12 days but because of how she helps people. It would be an honor to go to her show. the ophra sweepstakes is closed? but yut still have it up? This is the most wonderful and hard time of the year and why not spend it with the most WONDERFUL person of the year ELLEN !!! This is going to be another hard Christmas after loosing my dad 3 days before Christmas last year on 12/22/16. I miss his so much and know that he always watched your show and watched it with him the last days of his life while he was unconscious and on a vent in intensive care. There was not response out of him when I was laughing at you Ellen but I know he was laughing inside. You give everyone a reason to laugh with ever show you do and I thank you for that. Seeing you in person would be a blessing this holiday, and I know dad would know I was there at your show and watching above. Happy Holiday, Merry Christmas and hope to see you in person soon.